Are you looking for a unique, fun and sassy gift for that special woman in your life, well look no further. 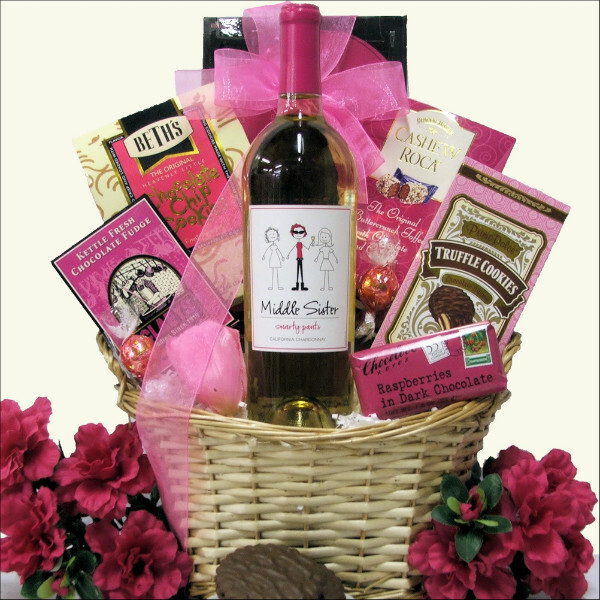 The 'Middle Sister' wine and sweets basket has everything a woman loves. Choose from a variety of 6 themed Middle Sister wines including, Drama Queen Pinot Grigio, Smarty Pants Chardonnay, Goody Two Shoes Pinot Noir, Forever Cool Merlot, Rebel Red or Mischief Maker Cabernet Sauvignon. In addition she will love the assortment of chocolates, cookies and candy featuring Brown & Haley Cashew Roca Buttercrunch Candy, Chocolove Dark Chocolate with Raspberries Bar, Lindt Milk Chocolates with White Chocolate Truffle Filling and more. A basket made just for her, no sharing allowed!